I woke up early this morning for a dentist appointment and knew pretty quickly I wouldn't be going anywhere. I wasn't puking or in pain, I simply lacked the ability to get out of bed, or for that matter, to sit up in bed. So there I remained, staggering to the kitchen every so often for a cup of something hot and soothing. Fortunately I didn't encounter any roving bands of delinquent kittens on the way or they might have done some serious damage. It's mostly the stress of planning a huge project without any department behind me, and no backup for the ever-growing pile of deliverables. There are important decisions to be made and no one but me to pull the facts together and recommend a course of action. 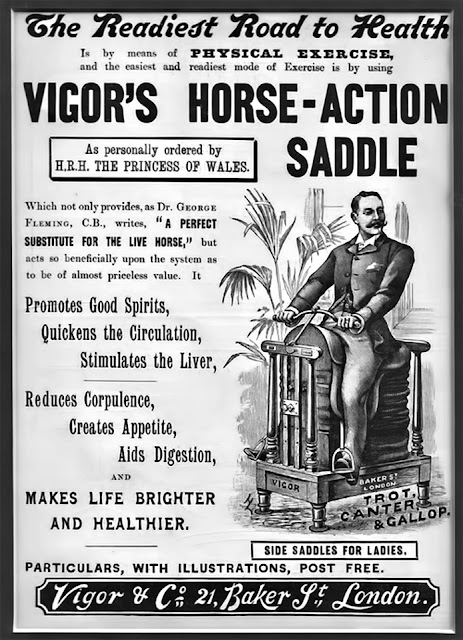 I really need this, a “perfect substitute for the live horse" so I can ride my genuine horse-action saddle while I'm on project team conference calls and get some of those promised good spirits and stimulated liver action going. I just can't decide whether I should get a sidesaddle or not.